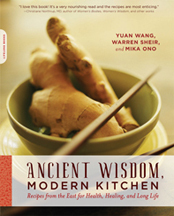 In Ancient Wisdom, Modern Kitchen: Recipes from the East for Health, Healing, and Long Life, Yuan Wang and Warren Sheir – both experts in Chinese medicine – and writer Mika Ono reveal how easy it can be to tap into the 3,000-year-old secrets of East Asian herbal cooking. This entertaining, easy-to-follow guide provides dozens of delicious recipes, anecdotes about various herbs, and all you need to know about acquiring ingredients – even if you don't yet know the difference between a lotus seed and the lotus position. See what people are saying about the book, which was selected as a winner in the San Diego Book Awards, Living Now Book Awards, and International Book Awards.